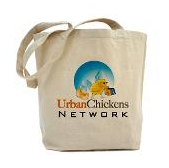 Urban Chickens Network blog: fifty pounds of chicken feed... gone! It seems like just yesterday I was worrying about how to properly feed our chooks. Checking my receipts, I see I bought our first fifty-pound bag of Layena crumbles Labor Day weekend. Here we are just two months later and we've dusted the first bag and I just spent $11.99 to buy another fifty pounds of chicken feed. Quick mid-blog-post math shows we spent $12 on feed and another $3 for the nesting material (aspen shavings) and we're up to $15.00 for the first 100 eggs. That's 15 cents an egg or $1.80 a dozen. Having our own hens producing in the backyard sure beats the heck out of paying $3.00+ a dozen for industry-produced organic brown eggs down the road at Whole Foods. And besides, when was the last time you saw a produce stocker chasing grapes? What about the pro-rated cost of the hen house, in your case an Eglu? That factors into the cost of caring for chickens, but being plastic, it should last a long time.